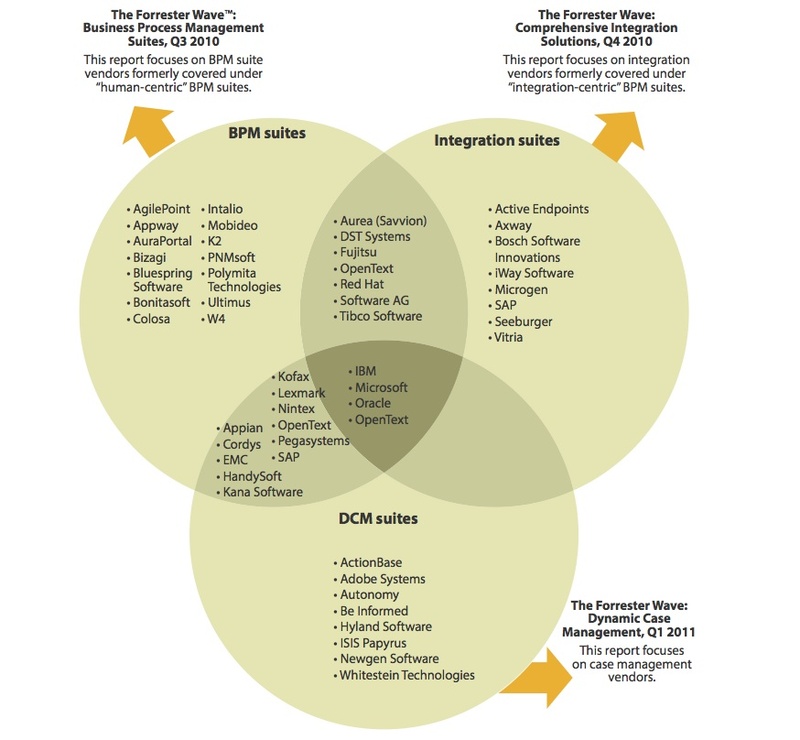 Forrester have just released their latest Wave report for BPM Suites today. 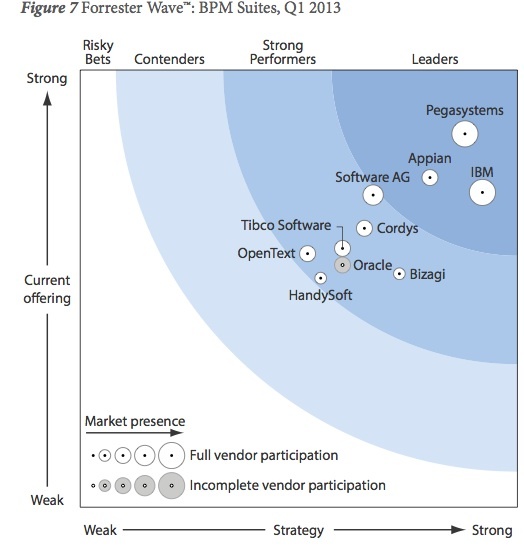 It’s another staple diet of much the same from Pegasystems, IBM and Appian although what’s more interesting is the placement of smaller industry veterans like Handysoft and Bizagi up against the likes of Oracle, OpenText (formally Global360) and TIBCO. Although only 10 vendors appear in the body of the report, the market representation is far wider and again it’s those who never feature for deeper analysis that miss out, such as K2, Ultimus, BP Logix, Isis. Interestingly, Polymita still features in the market report although it was acquired by Red Hat (bit of an error there) and to be honest, an open source vendor like Bonitasoft featuring in-depth is loooooong overdue now. Please sort this out Forrester. Oracle’s suite is for customers committed to the Oracle technology stack. Appian delivers a strong vision for social and mobile engagement. Cordys provides a robust platform with emphasis on (private) cloud provisioning. IBM delivers a unified experience for building enterprise-scale applications. Pegasystems extends its “build for change” ethos to encompass business stakeholders. Tibco Software positions ActiveMatrix (AMX) to play a pivotal role in its event-driven enterprise vision. Bizagi’s approach to marrying business processes and structured data is unique. HandySoft’s capabilities belie its ranking. OpenText changes direction to focus on the “smart process apps” market. Software AG sits in the middle of project and program. ← Why is the poor employee an afterthought in the process ? Theo, thanks for sharing with your audience the details of The Wave, and especially the support for BonitaSoft. Forrester was extremely narrow this year and left out a lot of deserving BPM Suites. In my view, it is their customer’s loss for not including more of the upstarts that are really shaking up the BPM business. Theo, as always, thanks for calling it like it is. Makes me wonder how many customers are paying hundreds of thousands of dollars for brand-name shelfware, rather than spending far less for features and functions they can actually use. Scott, interesting thing is, even if they’re not paying for brand-name software, they’re likely paying hundreds of thousands of dollars if they’re addressing the same scope of problem. The issue with the name-brand folks is that the entry price is high, but there’s some “entry level” amount of dollars that get spent to make any BPM solution work for customer – whether it is licensing, consulting, internal IT development/hiring, etc.